Articles on technology, Internet, Protocols, Web, Open Source, VoIP, P2P, SIP, RTMP and WebRTC. I gave a presentation last month titled Hello 1 2 3, can you hear see me now? highlighting my point of view on the origins of Internet video communication technologies we see today. The full text of the presentation can be found at Internet video communication: past, present and future. Modern video communication systems have roots in several technologies: transporting video over phone lines, using multicast on Internet2's Mbone, adding video to voice-over-IP (VoIP), and adding interactivity in existing streaming applications. Although the Internet telephony and multimedia communication protocols have matured over the last fifteen years, they are largely being used for interconnectivity among closed networks of telecom services. Recently, the world wide web has evolved as a popular platform for everything we do on the Internet including email, text chat, voice calls, discussions, enterprise applications and multi-party collaboration. Unfortunately, there is a disconnect between the web and traditional Internet telephony protocols as they have ignored the constraints and requirements of each other. Consequently, Adobe's Flash Player is being used as a web browser plugin by many developers for voice and video calls over the web. Learning from the mistakes of the past and knowing where we stand at present will help us build the Internet video communication systems of the future. 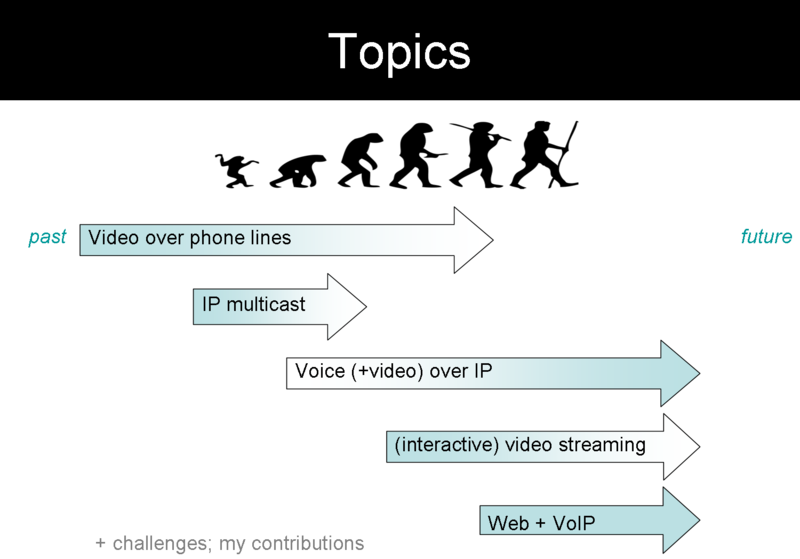 I present my point of view on the evolution, challenges and mistakes of the past, and, moving forward, describe the challenges in bridging the gap between web and VoIP. I highlight my contributions at various stages in the journey of Internet audio/video communication protocols. How to make phone calls from command line? SIP vs XMPP or SIP and XMPP? Copyright © 2005-2017. Kundan Singh. All Right Reserved.